(NaturalNews) The largest teachers union in Canada, the Elementary Teachers Federation of Ontario (ETFO), has passed a resolution requiring that cellphones in classrooms be turned off. The message behind the EFTO ruling; it's time to protect school-age children and teachers by turning off cell phones during school time. This is no small move for the 76,000 elementary teachers from Ontario who make up the ETFO. Echoing the concerns of her coworkers, teacher Sandra Wash, who spoke at the meeting, said, "There is cause for concern for members' health and safety, especially women." The ETFO's vote is supported by information from the World Health Organization (WHO), which classifies the microwave radiation emitted from cell phones and WiFi as a Class 2B carcinogen, meaning that it could possibly cause cancer in humans. A second vote demanded that school boards stop hiding WiFi transmitters in the ceiling and label them as part of a hazard control program. What about the dangers of microwave radiation and school-age children? Everyone who is exposed to the microwave radiation emitted from cell phones and other wireless technologies is at risk; however, children are especially vulnerable due to a thinner skull, a smaller head, highly conductive brain tissue, and exposure at a much earlier age (resulting in exposure for a longer period of time). But this is an incomplete list. Radiation exposures have also been linked to brain tumors, cancer, cardiovascular disease, depression and a long list of other serious illnesses. In addition to the concern over children and their health, teachers have their own cause for concern. Dr. Joel Moskowitz, PhD, a researcher at the University of California, Berkeley, as well as the director of the Center for Family and Community Health at the School of Public Health, elaborates on this concern. 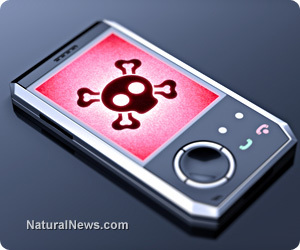 "There is evidence that cell phone radiation may damage sperm and increase male infertility, increase brain glucose metabolism and alter EEG readings, and may create neurological, memory, and sleep problems for some individuals." Other Canadian organizations are also voicing concerns about the proliferation of this microwave radiation, even the Canadian government. The Parliamentary Standing Committee on Health listened extensively to experts testify, as well as a call for a ban in schools on devices that emit microwave radiation, namely cell phones and WiFi transmitters. Across the globe, notably in France, Germany and Israel, concerns are growing, as demonstrated by the regulations, bans and strong recommendations issued by governmental and non-governmental agencies who are seeking to protect people from these radiation dangers. No doubt, these agencies are motivated by the knowledge that cell phone use beginning at an early age increases the risk of cancerous tumors developing in the brain by as much as five times. The Safe School Committee, another Canadian organization, while supporting equal access to technology in all schools, puts the concept of safety first. This concept includes, "The safe way to connect to the internet is with cables." And it's working. The majority of schools in Canada use cables to connect to the internet, not WiFi. Awareness is spreading as more and more research highlights the dangers of cell phones and similar technologies. Exposing our children to the unmonitored use of wireless technologies can no longer be defended.